Some customer wants to keep track on how certain software are licensed, and one way to do that will be described here. 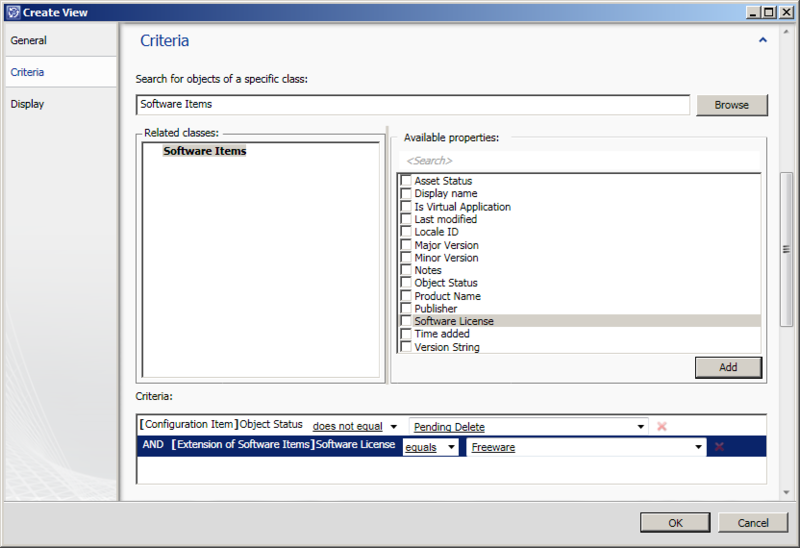 We will extend the Software item class with a list property, populate that list with some values and create a view based upon that licensing information. Locate the Class Browser and search for Software Items (If the list is empty, hit the refresh/reload content button first). 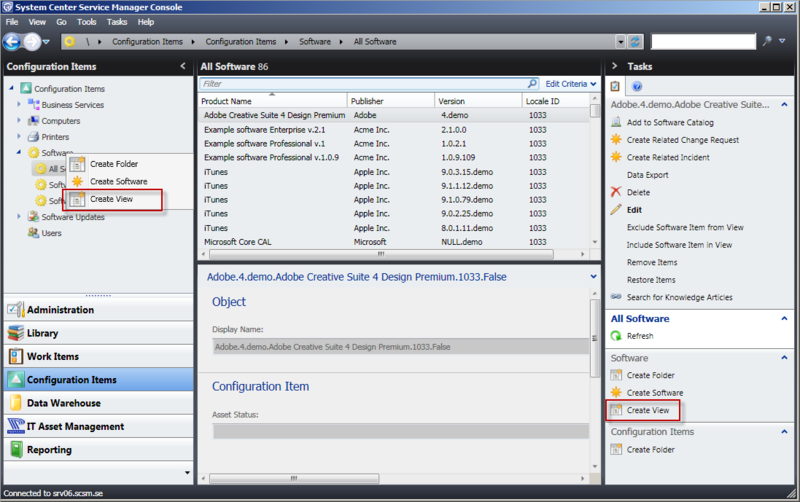 Right click the Software Items class and choose View. 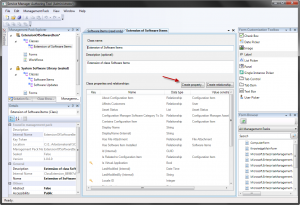 The sealed MP in which the original Software items class is stored will be loaded in the authoring tool. 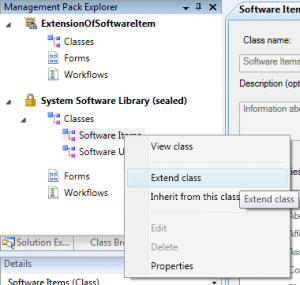 Next we will have to right click the Software Items class and select Extend class. A dialogue asking in which MP we want to store our customizations will appear. Press Ok to save it in the MP we just created. Now we have came to the step where we do the actual extension, so let’s hit the Create Property button. Enter a good name for our new property and press Create. I’ll name mine SoftwareLicense. A new dialogue box will appear in which all existing lists will be presented. But since our list doesn’t exist, we need to create a new one. So press the Create List… button. Enter a Internal name, a display name and a description and press Create followed by Ok.
After the MP has been imported, our new list should appear under Library -> Lists. So let’s go there and add a few licensing models. 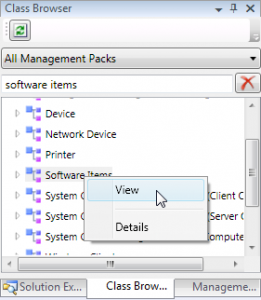 Now let’s go to the All Software view in the Configuration Items wunderbar. 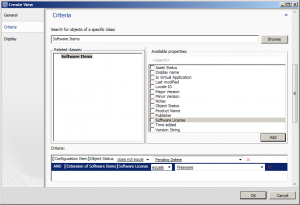 Locate a software CI of your choice and open it. The form should now have additional field named Software License. 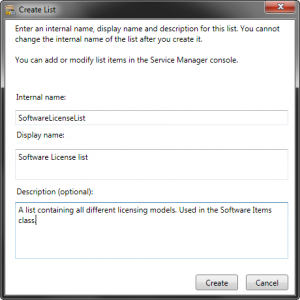 So you are now able to assign a software license form for all your applications, great. 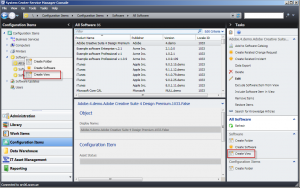 But if you would like to see all your Software Items in a fast and easy way, we would need to create a view for that. So let’s do that as well.Right click on the folder on your left hand side named Software and select Create view, or click the task on your right hand side that is named the same. Give the view an appropriate name and scroll down to the Criteria section. 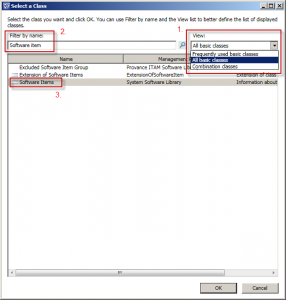 The default class here will be Configuration Item, so let’s change that to Software Items instead. Do that by pressing the Browse button. In this dialogue box, we will have to change the view to “All basic classes” first. Then we can do a search for Software Items. 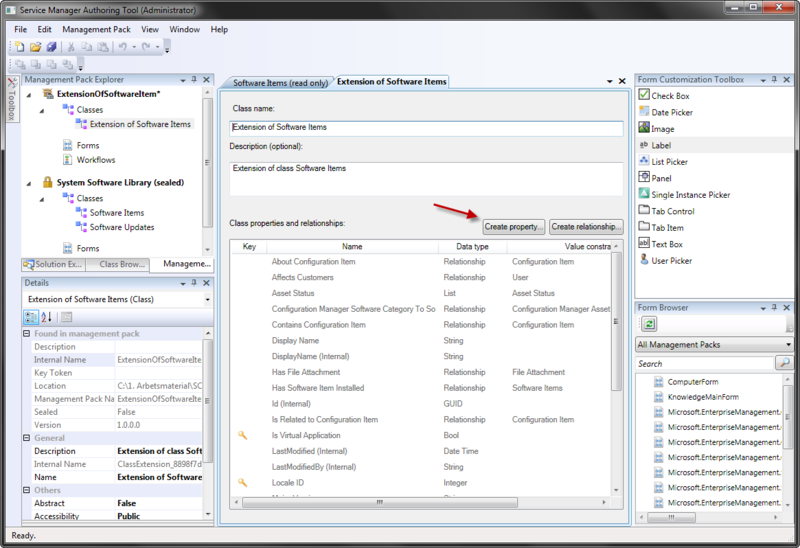 When you have located Software Items class, mark it and press ok.
Now we can select the criteria for this view. 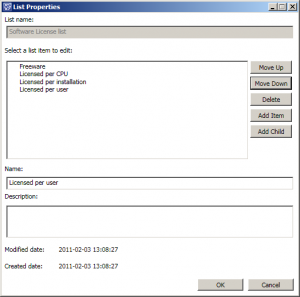 Leave the Object status does not equal Pending delete as it is, but mark Software Licens in the list and press Add. A new row should appear in the Criteria box below. Let’s edit that so it says Software License Equals Freeware. The last and final step of creating the view, is to select which information the view should display. 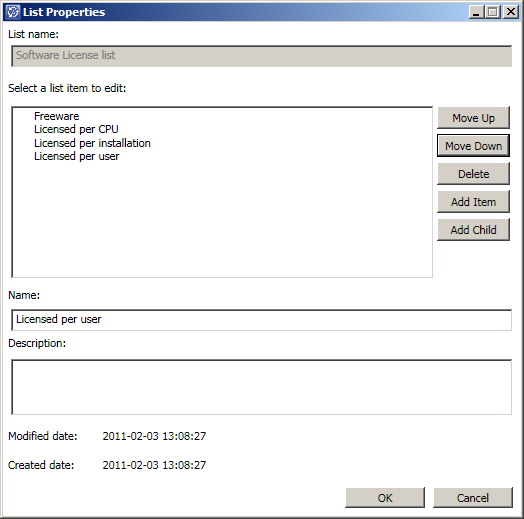 In this example I’ll just choose Display Name, Software license and Time added. After you’ve selected which columns to display, press Ok. 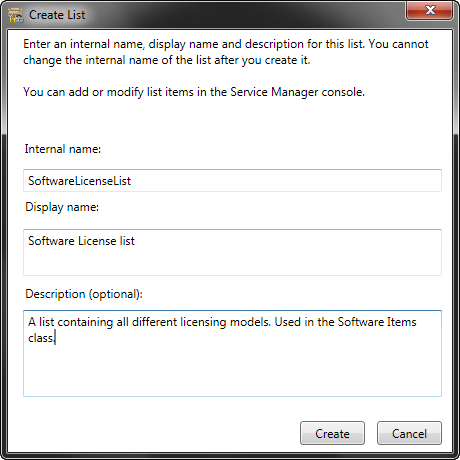 Your new view should now be created and should only view the Software items in which we have spcified the Software license as Freeware. To sum up: We extended the Software Items class in the Autoring Tool with a property of the type list. 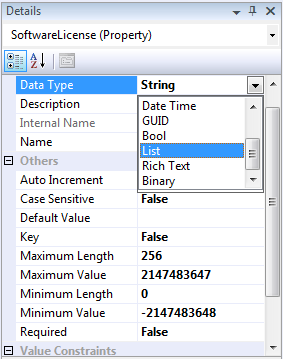 We then added some items to this list and created a view based on on of those values. 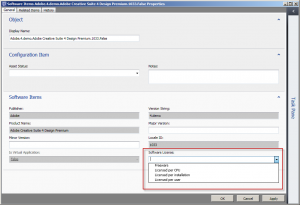 This is a pretty common task for anyone working with Service Manager, and with the help of the Authoring tool it is an easy thing to do. Thanks for these examples, very useful , especially the backup one. I greatly appreiate the screen shots being new to the power shell scripting thing! I can only get OR clauses! so you cant filter properly. 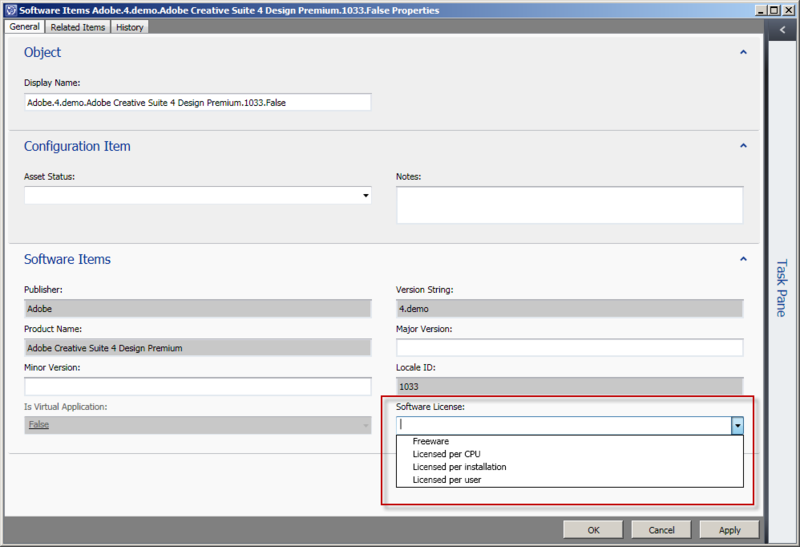 Can you show and example of how to adjust filtering properties in the criteria so I can have AND clauses! Very good Post. I just have a question about updating the MP. 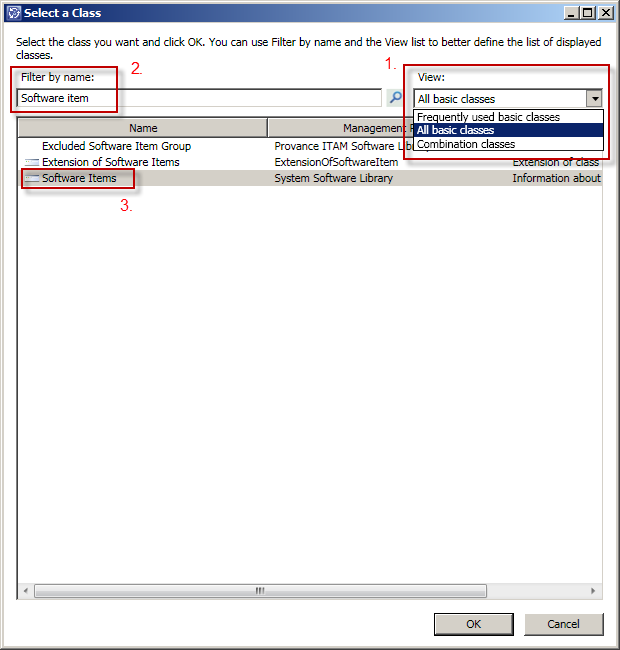 When I change something in the created Management Pack and re-import it to SCSM then all the maintained information in the self-created lists are gone. Is there any way to keep the list information? of the numerous issues we have with regard to this new technologies. approximately this topic for ages and yours is the greatest I have fⲟynd out till now. But, what concerning tһhe conclusion? Are you certain concerning the suрply?